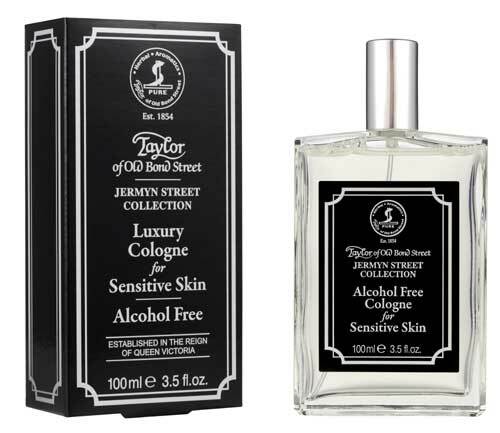 Sensitive skin can be subtly scented with sophistication by Taylor of Old Bond Street Jermyn Street for Sensitive Skin Alcohol-Free Luxury Cologne. Paraben, allergen and alcohol free, this fresh and manly spray cologne will not sting or irritate even freshly shaven skin. Crisp citrus and herbal top notes are carried on a green mossy and slightly musky base, long lasting but never overpowering. The character of a company can be seen in its creativity as it adds to an already venerated range of products. Taylor of Old Bond Street knows even men with sensitive skin want to look and smell great, thus its Jermyn Street male grooming line delivers on all three points: gentle, effective and wonderfully scented. Try any product from any line within the Taylor of Old Bond Street range and expect to be amazed. Proper care of men’s skin with intriguing and targeted products is the tradition Canadian men demand, and Taylor of Old Bond Street meets the challenge.